Just as it was predicted earlier in the year, the color coral is a spring must have trend. The dress that I’m wearing today is my second that I have in the coral color. 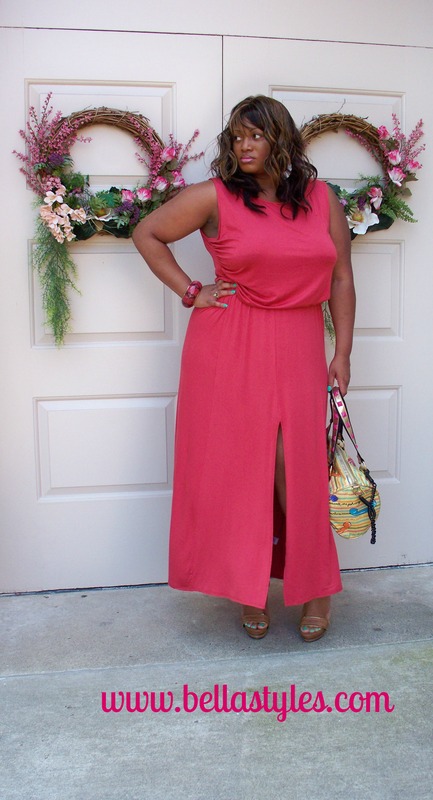 I blogged on my other coral dress here a couple of weeks ago. The maxi that I’m wearing today is the Gibson Bloused Knit Maxi from Nordstrom. In the description it says that it is orange, but like I stated, it is a coral color. The weather here today in VA is set to be in the triple digits so I wanted to wear something that would keep me as cool as possible. I kept it pretty simple with basic tan sandals and my colorful Betsey Johnson phone purse. Under my maxi I am wearing a Va Bien Firm Control Bodysuit. As I’ve said many times I am an avid fan of shapewear. A woman with curves should have at least 4 or 5 shapewear choices in her wardrobe. I was contacted recently by the reps from the Va Bien company and I chose to do a review on the piece that I’m wearing today. Like I said earlier, today was supposed to be in the triple digits here and most ladies would shy away from a girdle. But I chose to wear mine because number one, it has an opening in the crotch area so that’s make all the difference when using the restroom. Plus, as I looked back over my pics from FFFWeek this weekend, one of my dresses that I wore, here, I could have used a better undergarment with it. Hey, I’m not perfect and I grabbed the wrong one for that particular dress. (Wish I had my Va Bien then but I didn’t receive it until I returned from my trip). So I said that I wouldn’t make that mistake again of not pairing up the proper control shapewear under my maxi dresses. Lastly, I really like this Va Bien bodysuit that I chose because it has a low-plunge back which will be great for a low cut back dress. Since 1979, Va Bien is the solution-driven lingerie & shapewear brand that has solutions for any silhouette, for even the trickiest of dresses: from low-plunge bodysuits and low-back bustiers to high waist briefs (some are even bottom-lifting), seamless body shapers, a convertible strapless bra and more. Specializing in full figures, Va Bien bras are available up to I cup, bustiers & bodysuits up to DDD, and bottom shapers up to 6XL (dress size 26-28). A go-to for celebrity stylists, Va Bien has most recently been worn on the red carpet by Kelli Garner (White House Correspondence Dinner) and Jessica Lange (SAG Awards), as well as by Melissa McCarthy in the February issue of W.
Retailing from $28.50 – $90.00 in numerous locations throughout the U.S., including online at BareNecessities.com, HerRoom.com and VaBienUSA.com.